Hello ... Hello ... my old friends ... It's great to see you once again! I would just like to take this opportunity to thank all of you for visiting my blog ELO Beatles Forever [ELOBF] this year and to wish you a magnificent, musical and ELOtastic New Year! 2010 has quite simply been a marvellous year for ELO Beatles Forever [ELOBF] thanx to you! There have been many highs and no significant lows to mention. Joining Facebook has also opened up a new avenue of contacts both in 2010 and going forward into 2011. 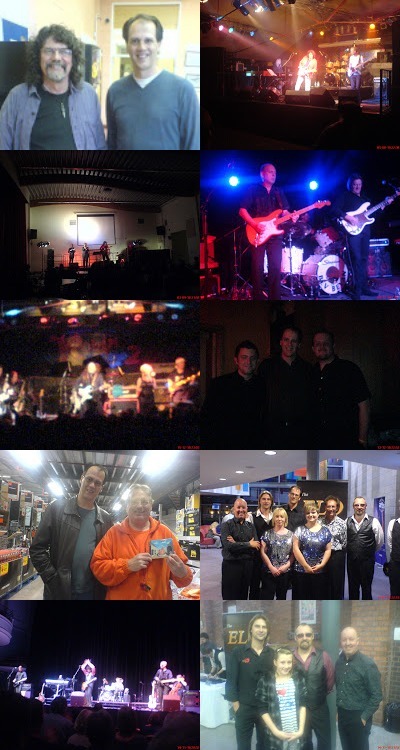 But let us briefly review the gigs that I can remember at the time of writing: two Beatles Blues & Blue Violin Project [BBBV] gigs, two Wheels Of Fire gigs, two ELO Experience gigs, a Roy Wood gig, two Animals with The Move gigs and a fab BeatBack Brothers gig. Highlights have also included taking James and Rebekah to their first ever live gig by The ELO Experience, introducing you to Sean Mack Page and his bands Fragile X and Imaginos, introducing you to Pete Dicks and his Beatles and Beyond Radio Show; introducing you to Hamilton Radio and interviewing Julianna Raye. Yours Truly KJS have a number of projects in hand for 2011 including not a few interviews, [hopefully] some ELO based radio shows and some assistance with the 2011 ELO Fan Convention in August. We lost Mike Edwards and Tony Curtis in 2010 and we remembered their ELO legacies ... we saw the long awaited DVD release of the 1976 Fusion gig with other material but we sadly did not see any new ELO & Jeff Lynne album release. We do however look forward to said Jeff Lynne release in 2011 and more The Orchestra [former members of ELO & ELO Part II], Phil Bates, BBBV, The ELO Experience, BeatBack Brothers, The Move, Roy Wood gigs et al in the coming year. 2011 is set yo be an exciting year not only for ELO Beatles Forever [ELOBF] but for all ELO [and related artistes] fans! "Just on the border of your waking mind, there lies another Time ..." in 2011 so you'd better "Hold On Tight to your dreams" ... See you there folks!